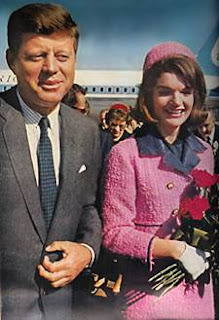 No suit of the early 60s is more famous or better remembered than that worn by Jacqueline Kennedy on November 22, 1963. She had been given bad weather reports. The Chanel pink suit was wool and thus uncomfortably warm on a hot Dallas day. She wore her signature pillbox hat which had become all the rage. By the way, it was Mrs. Kennedy's hats which gave Halston his first serious public exposure as back then, he was a milliner. Jackie was only 33 years old when she became First Lady, the youngest ever. During her brief tenure in the White House, she brought an elegance to dressing, a style to American life. Unlike her predecessors, she wore European couture dresses, but this presented political problems. She needed to dress in American designs more often. Eventually she found her way to Oleg Cassini, a French-born Russian turned naturalized American. Cassini gave her Americanized versions of French designs, clean lined, in the bright, solid colors she preferred, but with oversize buttons and coat pockets that his Hollywood experience told him would stand out in photographs. Jackie's trademarks were the boxy jackets and pillbox hats, the three-quarter-length sleeves, the lace mantillas, the overblouse dresses and the sleeveless A-lines.